ATTENTION: BEGINNING IN 2018, ALL RV SALES WILL BE HANDLED BY THE COUGAR ATHLETIC FUND. RV parking is available for Home Football Games. Overnight parking is available for those Recreational Vehicles (RVs) that are fully self-contained. There are no hook ups available. 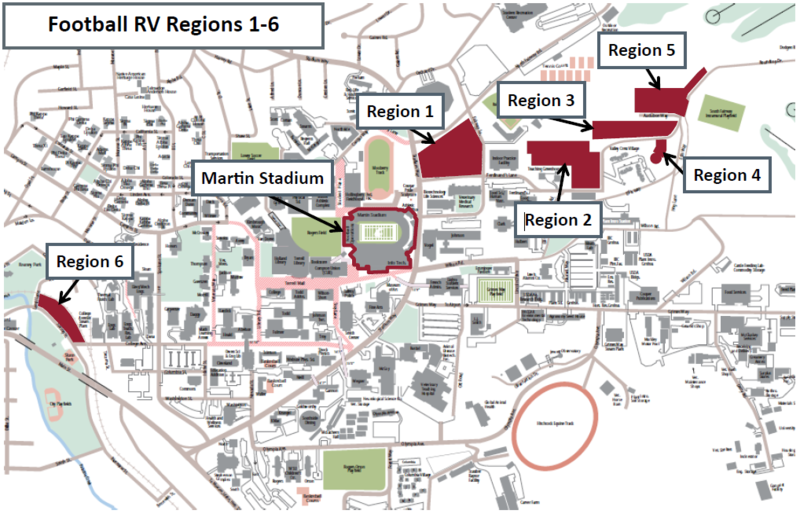 The designated RV parking areas for Home Football Weekends are RV Regions 1, 2, 3, 4, 5, and 6. During Home Football games, special policies have been developed to help facilitate the numerous RVs that need to park on campus. Note: RV parking rules for Home Football Games are different from RV parking rules for University Event RV Parking. Please click on a specific RV Region to see the RV information, rules, and how to purchase a permit for that region. Please visit the WSU Cougar Athletic Fund for purchasing information. A self-contained camper trailer with the accompanying Tow Vehicle (truck and trailer combination considered a RV). A self-contained camper on the bed of a truck (a truck with a canopy is not considered a RV). The vehicle used to tow or pull a non-motorized camper trailer. The tow vehicle is considered part of the RV and there is no extra charge for the tow vehicle. Only one tow vehicle is allowed with a non-motorized RV. Extra vehicles are not allowed in RV areas with RVs accompanied by Tow vehicles. A vehicle that accompanies a motorized coach RV or is pulled by a motorized coach RV. The extra vehicle must arrive with the motorized RV to be allowed into the RV parking areas. Only one extra vehicle is allowed. There is no charge for an extra vehicle. Tent camping is not allowed on the WSU campus for home football games or any other events. For the purposes of RV parking on the WSU campus, self-contained means an RV that is originally designed and manufactured to provide facilities for human habitation which includes lodging, cooking, water storage, and sewage disposal, and is enclosed within the solid body shell of the RV. Anything outside of this definition needs to have written approval from the WSU Cougar Athletic Fund or the Senior Associate Athletic Director with oversight for Event and Facility Operations. A cooking device on a trailer that is not an original part of the RV. All Cooking Trailers must have written permission from the WSU Cougar Athletic Fund or the Senior Associate Athletic Director with oversight for Event and Facility Operations and fit within the marked RV space the patron has purchased. Please click here for the latest burn ban information.